April Specials at Ocala Breeders Feed and Supply. Grand Champion Fly Spray Shine is now $12.99, a savings of $3.00 OFF. Grand Champion Fly Repellent with Show Ring Shine by Farnam kills and repels annoying flies, mosquitoes, and gnats while delivering a lustrous show shine. The continuous spray is simple to use and you can hold it any way you want. For use on horses to kill and repel stable flies, horn flies, face flies, horse flies, deer flies, mosquitoes and gnats. Plus can also us a grooming aid and coat conditioner for that sparkling shine. 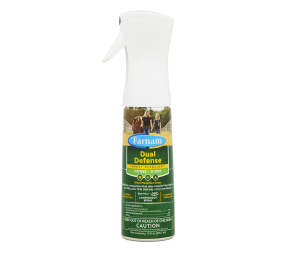 This month get $2.00 OFF Dual Defense is only $16.99. This family-friendly mosquito, tick and biting fly repellent spray can be used with confidence on the whole family, horse, and human. 12-hour protection for humans from mosquitoes and ticks. Receive 10% OFF Quickstrike Spray 5lb. in the month of April. 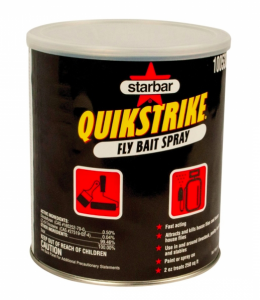 Fast-acting QuikStrike® Fly Bait Spray easily covers walls and other surfaces. Good for in and around dairy, swine and poultry operations, and livestock facilities. Attracts and quickly killing house flies. Can easily be placed in hard-to-reach places where scatter baits can’t reach. 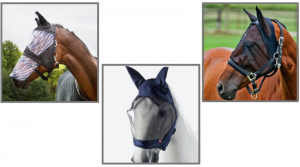 Save on Finn Tack Fly Mask on sale for 10% OFF. The Fly Mask protects from flies and other biting insects. Provides clear vision with superior eye dart stitching for enhanced safety. Excellent eye protection if you need to protect your horse’s eyes from insects or small particles. Ocala Breeder’s Feed and Supply strives to provide monthly specials throughout the various lines of products we carry. Moreover, sale prices are valid for in-stock items only. Furthermore, if you have any questions or need more information contact us or stop by the store anytime.